I have been working on getting R writing more. I have found that writing prompts can be a great way to encourage her creativity. I sat down the other day and spent some time putting together a Holiday writing printable pack for us to use as an addition to our writing curriculum this year. I thought it would be a lot of fun to share this pack with you. 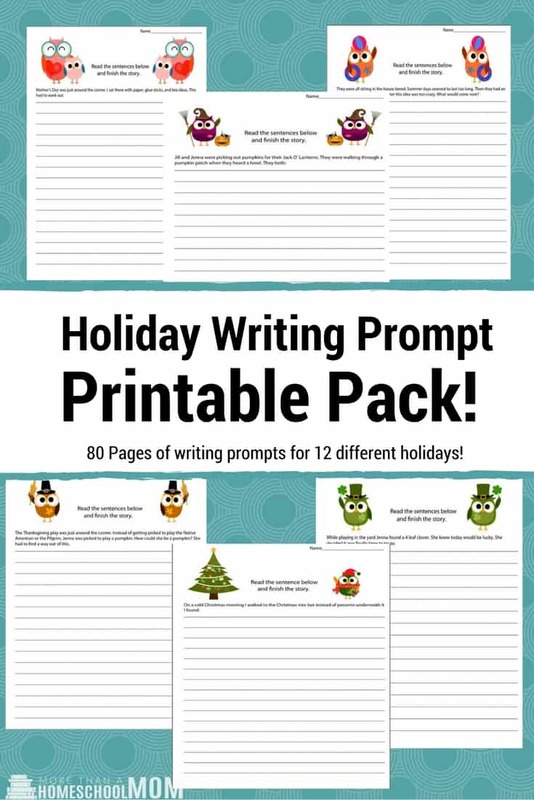 What is in the Holiday Writing Prompt Printable Pack? I filled this pack with 80 pages of writing prompts just for you. Ring in the New Year with these fun writing prompts. Not only can you have fun making Valentine’s for a fun unit study. Now you can have a great time writing with these Valentine’s Day writing prompts! Have a little bit of fun with leprechauns and pots of gold with this fun printable pack. I’m sure there will be some amazing stories coming from these writing prompts. Looking for a way to have a little fun with the kids for Easter? These Easter writing prompts are sure to get their imaginations going. Have a little fun with the Easter bunny or the annual Easter Egg Hunt. Are you doing a unit on Cinco De Mayo this year? I have put together a few fun writing prompts for the Cinco De Mayo that your kids are sure to have fun with. Are you looking for something fun for the kids to do for Mother’s Day? Have fun with these great Mother’s day writing prompts. You might be surprised at how creative they can get. Father’s Day can be a fun time for kids as they hustle to put together the perfect gift. Have a little fun with this Father’s Day and challenge your children to write dad a great story using one of these fun writing prompts. Are you looking for a fun way to celebrate the week of Independence Day? Try out these fun writing prompts that are sure to get your kid’s creativity going. There are some really fun prompts here to take them back in history or let them have some silliness with the family picnic. Are you enjoying your Summer? Looking for a way to get the kids writing during Summer break? These fun printable writing prompts take your normal Summer situations and add a silly twist to give your child something to write about. This is a great option for the dreaded “I’m Bored” of Summer. Whether your children going back to traditional school or homeschool this year they are sure to have fun with these great printables. Did something get left in a backpack for the entire Summer? Are you making History actually come to life? Find out what your kids can create in this printable pack. Are you getting ready for Halloween? Why not have a little Halloween fun with your writing this year? Whether we are talking about missing costume pieces or the scary house on the hill, your child is sure to come up with some great spooky stories. This printable pack is filled with 8 pages of Thanksgiving writing prompt fun. Some of the prompts include figuring out what the family will do when the dog eats the turkey and picking the silly antics of a child who wants to play a Thanksgiving prank. I am willing to bet you will get a laugh out of the stories that come from these writing prompts. It’s time to have a little Christmas fun in your writing. Whether your child is in charge of the first day of work for a new elf or the coming problem the snowmen found with Christmas, they are sure to put together some really fun stories. There are 8 pages of writing prompts in this pack.